← How Did Milford Vote in the State Election? 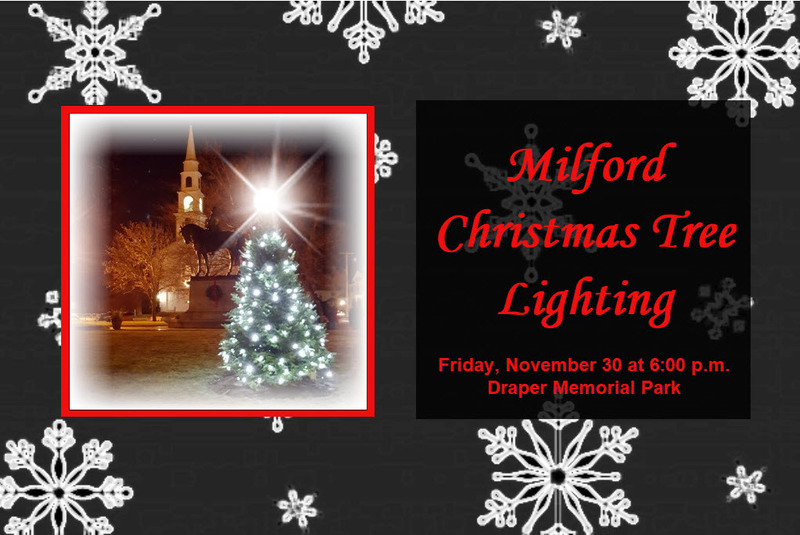 Citizens for Milford is planning the Fourth Annual Milford Christmas Tree Lighting ceremony in Draper Memorial Park on the evening of Friday, November 30. All Milford residents are invited to arrive at 6:00 p.m. for cookies and hot chocolate. The tree will be lit at 6:30 p.m. This community event is free and open to everyone. Highlights of this year’s event will include the holiday carol sing-along led by members of the Greater Milford Community Chorus, as well as a special visit from Santa Claus. Santa will arrive at 6:00 p.m. and will visit with kids and families until the event ends at 7:00 p.m. Families are encouraged to take their own photos with Santa. 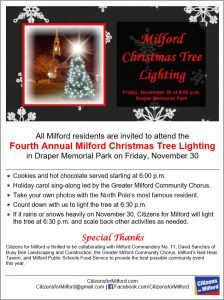 If it rains or snows heavily on November 30, Citizens for Milford plans to light the tree at 6:30 p.m. but will scale back other activities as needed. Citizens for Milford is thrilled to be collaborating with Milford Commandery No. 11, David Sanches of Busy Bee Landscaping and Construction, the Greater Milford Community Chorus, Milford’s Red Heat Tavern, and Milford Public Schools Food Service to provide the best possible community event this year. Draper Memorial Park occupies a triangle of land in the downtown Milford area, located at the intersection of Congress Street and Main Street. Parking is available in lots behind Main Street businesses. Help us spread the word! Download the event flyer. And let us know you are coming on our Facebook event page.